Riva del Garda is the main lakeside town on Lake Garda's windy, watersports-oriented northern shores, and the first thing you need to know about it is that it is a part of Italy's Trentino Alto-Adige region. A view of Lake Garda from the lakeside promenade in Riva del Garda. (Photo by Markus Bernet)Yes, every Italian region is proudly different—but some are more different than others. The Trentino is so solidly Teutonic that beer and sausages replace wine and pasta on the menus. And even though everyone speaks Italian (and, since it's a tourist destination, English as well) the local dialect is actually a medieval form of German called Tirolesische. Riva marks the southern end of the South Tyrol, half of an ancient cultural region that today happens to be split between two countries: The South Tyrol here in the Trentino Alto-Adige, and the North Tyrol which is now in Austria around Innsbruck. Piazza 3 Novembre and the Torre Apponale. (Photo by Joachim Köhler)Riva del Garda guards the north end of the lake, a bustling Teutonic town with colorful palazzi and panoramic views from the top of the medieval Torre d'Apponale on the sunny, harborside Piazza 3 Novembre (tel. +39-0464-573-869). Rocca di Riva. (Photo by Jan Sende) A few blocks away, Riva's 14th century Rocca castle is surrounded by a moat and a small park at Piazza C. Battisti 3a (tel. +39-0464-573-869; www.comune.rivadelgarda.tn.it/museo). Riva's lakeshore neighbor Torbole shares an allegiance to the Trentino region and the same winds beloved of sailboarders, but not nearly the crowds of Riva. Aside from lake sports, Torbole is famous chiefly for a brilliant bit of naval strategy back in 1439. 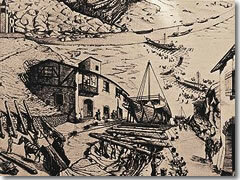 The Venetian ships of 1439, being hauled up over the mountains to Torbole. 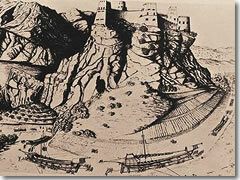 The Venetian ships—still being pulled on rollers by men and oxen—skirt aorund a castle en route to Lake Garda. Venice was, as usual, at war with Milan. One of Venice's protectorates, Brescia, was under virtual siege by the Visconti so Venice needed to get it some supplies. The problem was, Milan controlled the southern end of Lake Garda. So Venice sailed 25 boats and six galleys up the Adige River—then used 240 oxen, hundreds of men, winches, and rollers under the keels to drag the ships, overland, up over the mountains and down into the north end of the lake at Torbole. As impressive as the feat was, it seriously damaged many of the ships, and the fleet was defeated at the Battle of Maderno. The Venetians then did what they probably should have in the first place: they built new ships in Torbole itself, launched against Milan again, and in 1441 won the final victory, gaining control of the northern lake. This is part of why, to this day, most of Lake Garda is split between the Veneto region (historically ruled by Venice) and the Lombardy region (of which Milan is the capital). 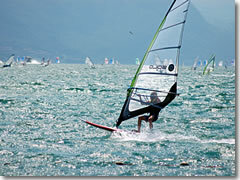 A sailboarder on Lake Garda near Riva del Garda and Torbole. (Photo by Lee Gates) The north end of Lake Garda is also buffeted by strong morning winds called the sover or peler blowing down from the Sarca Valley to the north, and in the afternoon blasted by the ora winds coming up the lake from the south. 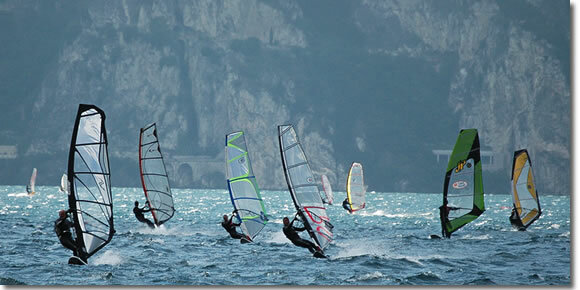 Together these make for some of the best windsurfing and sailing conditions on any lake in Western Europe, and all summer long water-sports fans flock from far and wide to Riva and its neighbor Torbole to thrash the waves. Notes: Most water sport rentals available from mid-April to late October. The local outfitters below are listed roughly in rising order of price, so the first ones in each category tend to be the cheapest. Pier Windsurf, Hotel Pier, Località Gola 2, Riva (tel. +39-0464-550928; www.pierwindsurf.it). Surf Segana, Porfina Beach/Camping Bavaria, Lungolago dei Pini 19 (tel. +39-0464-505-963; www.surfsegnana.it). Surf Segana, Porfina Beach/Camping Bavaria, Lungolago dei Pini 19, Riva (tel. +39-0464-505-963; www.surfsegnana.it). There's a rowboat rental spot at the docks by the Rocca di Riva castle in Piazza C. Battisti park. 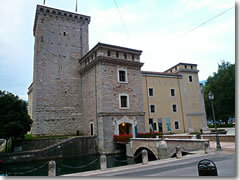 The Torbole sul Garda tourism information office is at Lungolago Conca d’Oro 25 (tel. 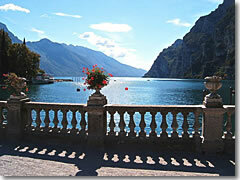 +39-0464-505-177; www.gardatrentino.it and www.visittrentino.it). By car: Tricky. Best to arrive by car and take the torturously winding SS45bis highway along the lake's western shore—lots of tunnels, lots of pretty views, but be warned: rockslides close the road down a few time every year, especially along the Limone-to-Riva stretch. You can also avoid the lakeside and instead zip north up the A22 autostrada highway from Verona toward Trent, exiting at Mori/Marco for the SS240 across the low mountains to Torbole and Riva. 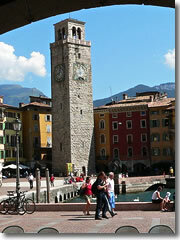 By train: Desenzano del Garda, at the southwestern corner of Lake Garda, is a stop on the main Venice–Milan train line. From Desenzano, there are nine buses daily to Riva (about 2 hr. ; www.trasportibrescia.it). By bus: In addition to those nine daily buses from Desenzano (about 2 hr. ; www.trasportibrescia.it), you can catch one of a dozen daily buses from Salò (70 min.) that also passes through Gardone Riviera (60 min.) and Limone (15 min.) en route to Riva. From Malcesine on the lake's eastern shore there are hourly buses daily (25 min. ; www.atv.verona.it). If you don't take a tour or have a rental car (recommended), the easiest way is by bus (www.trasportibrescia.it for the western shore from Desenzano; www.atv.verona.it for the eastern shore from Verona) or—less frequently but far, far more scenically—by boat (www.navigazionelaghi.it). "How much I wished to have my friends for a moment near me in order that they might rejoice over the view which lies before me." Wolfgang von Goethe, in a letter sent from Torbole on 12 September, 1786, writing perhaps the first ever "wish you were here" postcard from Lake Garda.